I always listen to music while writing, as I find it allows ideas to flow more freely. Today, I’m listening to Lauren Hill’s Doo Wop, which is a cautionary tale, albeit about men, with no clear relation to mortgages. But – and bear with me here – let’s go with the cautionary theme for this month’s mortgage update. The Bank of Canada reiterated its concerns over Canadian household debt and the country’s resilient housing market, at this month’s interest rate announcement, which reignited discussions on further intervention in the mortgage market by the Department of Finance. Since September 2010, the central bank has kept the target interest rate – on which mortgage rates follow – at 1%, and delivered essentially the same message at its scheduled announcements: current economic conditions constrain them from raising the interest rate, but a hike is imminent. At the bank’s latest announcement, however, the rate remained constant but the accompanying message did not. Does this mean interest rates may (gulp!) fall? At the press conference following the announcement, Les Whittington of the Toronto Star recounted that Bank of Canada Governor Stephen Poloz told reporters continuing weak economic data might cause the bank to “rethink” its current rate-setting stance. CIBC Chief Economist Bejamin Tal told Garry Marr at the Financial Post, “it’s possible interest rates will go down”. Although it is possible the Bank of Canada may drop the target interest rate, it does seem highly unlikely. The bank acknowledges concerns over Canada’s housing market, which has rebounded beyond expectations after last year’s mortgage rule tightening. Lower mortgage rates would only add fuel to the fire. So, this means it’s up to Finance Minister Jim Flaherty to make a move, if need be. Realizing this, Flaherty told the Canadian Press, “it does fall to the Department of Finance to do anything if we’re going to do anything, because there’s basically no room for the Bank of Canada to move”. He further stated he had no intention of acting at the moment, but he would be keeping an eye on the market. When rates looked like they were on the rise again, fixed mortgages seemed to be a safer bet, but it looks like rates will stay low for a few more years. With talks of an interest rate hike dwindling, variable rates are looking increasingly attractive to mortgage borrowers. 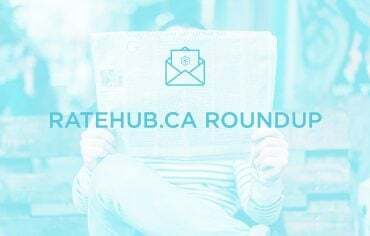 At Ratehub.ca, we’ve seen a gradual shift in popularity towards variable rates over the last few months, compared to earlier this year when fixed rates accounted for close to 85% of mortgage requests. The spread (difference) between variable and fixed rates was also larger then, meaning the premium paid for interest rate certainty was much lower. Now, the spread between 5-year variable and fixed rates is around 1%, closer to historical norms. Get all our best content and a mortgage rate update in one monthly newsletter. Subscribe now or miss out on a condensed version of everything important. We’re looking for freelance writers! If you like writing about money, for money, e-mail [email protected]. If you haven’t been acquainted with Ratehub.ca’s Founder Alyssa Richard, you must have been avoiding the news this month. She was featured in entrepreneur profiles in the Financial Post and Toronto Standard, as well as Preet Banerjee’s new financial podcast.